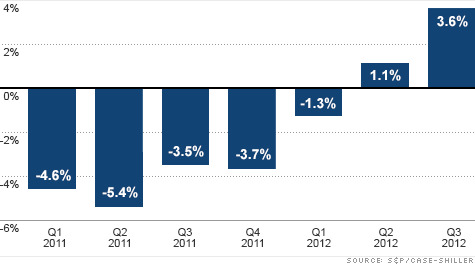 Home prices are up for the 2nd straight quarter, the biggest year-over-year increase in more than two years. Home prices: Biggest rise in more than 2 years. I have been demonstrating to a friend of mine that there are continued positive signs in Real Estate, and he thinks I am full of it. Instead of arguing with him, because it is possible he subscribes to, “The Daily Pessimist”, (Yes, I made up that magazine name) I try to present him with facts, and articles from prestigious sources like this one. At some point, I hope this friend of mine admits that he overpaid, and should have gone with a real estate agent to negotiate on his behalf in the first place. Some people think they can do it all, and don’t need to work with others… he made a mistake, and I probably won’t hear him admit to it in the 70+ years that I will know him. Yup, that is right, we are both going to live into our 100’s.